PennDOT Engineering District 10 and the Clarion Borough Police Department teamed up in a continuous effort to reduce pedestrian injuries and fatalities by conducting a Pedestrian Safety Enforcement Campaign on Wednesday, July 18, along U.S. Route 322, Main Street Clarion. 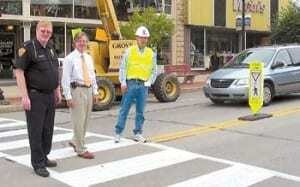 PennDOT reminds motorists anyone observed failing to yield to a pedestrian in a crosswalk will be issued a citation. Those who are not wearing a seatbelt may receive two citations. Several drivers received citations during the campaign for not yielding to pedestrians. PennDOT is looking at different solutions to try and solve resident concerns regarding pedestrian safety. “The first step is education and enforcement,” said Shawn Houck, PennDOT safety press officer. Above, from left, Mark Hall, Clarion Borough Police Chief, Jim Crooks, borough business owner and Houck, across Main Street testing driver awareness.